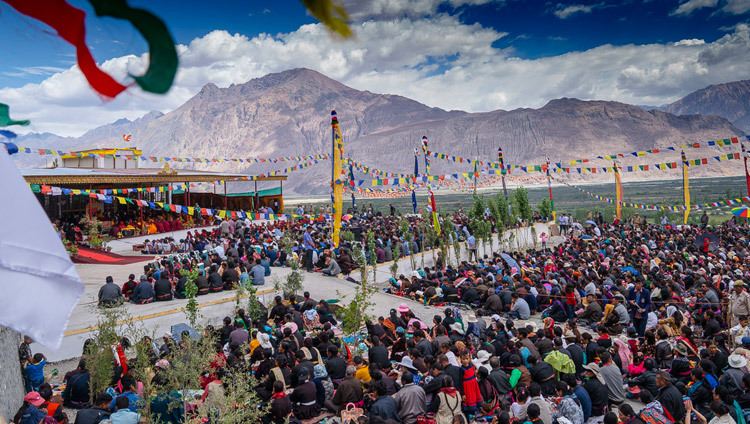 (TibetanReview.net, Jul14, 2018) – Some 5,600 devotees attended the Dalai Lama’s religious teaching given Jul 13 on the teaching ground next to the Diskit Phodrang in the Nubra area of Jammu & Kashmir state’s Ladakh region. The Dalai Lama is visiting the region till Jul 21 as a monsoon getaway and to give religious teachings, having arrived there sometime in the beginning of this month. Those who received him included his host, former member of Rajya Sabha (Upper House of Indian Parliament) Thiksey Rinpoche, as well as former Ganden Throneholder Rizong Rinpoche, besides many others. He led a session on the generation of the awakening mind of bodhichitta, something he said he practiced himself daily, and also gave guidance on meditating on emptiness. Copies of the texts of his teaching were made available in Tibetan, English and Chinese languages in keeping with the requirement for the assorted crowd of devotees. Explaining the purpose of looking for the reality of things, the Dalai Lama has thus quoted Nagarjuna’s observation: “Through the elimination of karma and mental afflictions there is liberation; karma and mental afflictions come from conceptual thoughts and these come from mental fabrications. Fabrication ceases through emptiness.” The point, he said, is to eliminate distorted views that give rise to disturbing emotions. The Dalai Lama was stated to have been joined for lunch by representatives of Muslim communities in Ladakh’s Turtuk, Bogdang and Nubra areas.